Is your Goddaughter getting married? If you need a special gift for her, consider this EXCLUSIVE Goddaughter Wedding Gift. 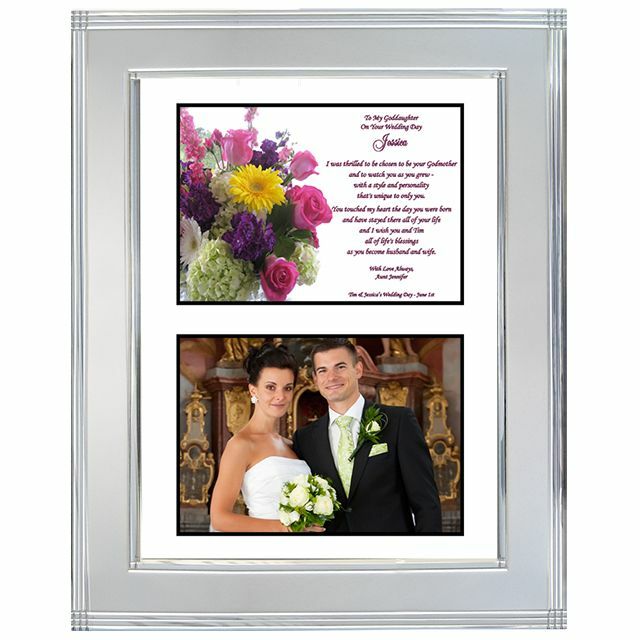 The touching personalized poem in a beautiful flower bouquet design is framed in an exquisite silver metallic picture frame. You or the bride can easily add her wedding photo to make this a very unique wedding present...one that you will be proud to give. You've been a part of her life since her baptism day and now your Goddaughter is getting married. Our original Goddaughter Wedding Gift is so unique and lovely and a perfect gift for the bride to be. It's such a special gift because the heartwarming poem can be personalized with the couple's names, wedding date, and a special closing from you. After the wedding a picture of the happy couple can be easily attached. Now it becomes a wedding keepsake to treasure and display for all to see. 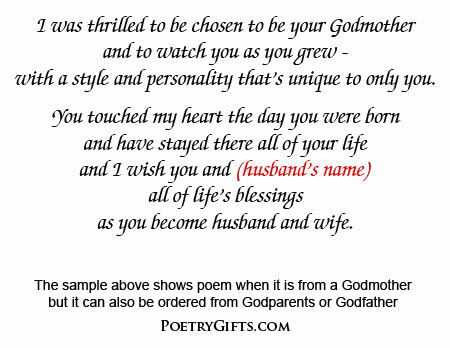 This Poetry Gift will let your Goddaughter know that You Love Her...You're Proud of Her...And You Are So Happy For Her! Your Poetry Gift is designed with a cut-out opening in a mat so a 4x6 inch photo can easily be inserted. The photo opening is 4" x 6". This size opening is perfect for standard size photograph, but you can also display the most important part of a larger photo. 1. Phrase Above Goddaughter's Name: To My Goddaughter On Your Wedding Day, To My Goddaughter, etc. 4. Closing Phrase and Your Name(s) (as seen after poem): Love Always, Aunt Kathy; Wishing You Love & Happiness, Aunt Cindy & Uncle Tom, etc. 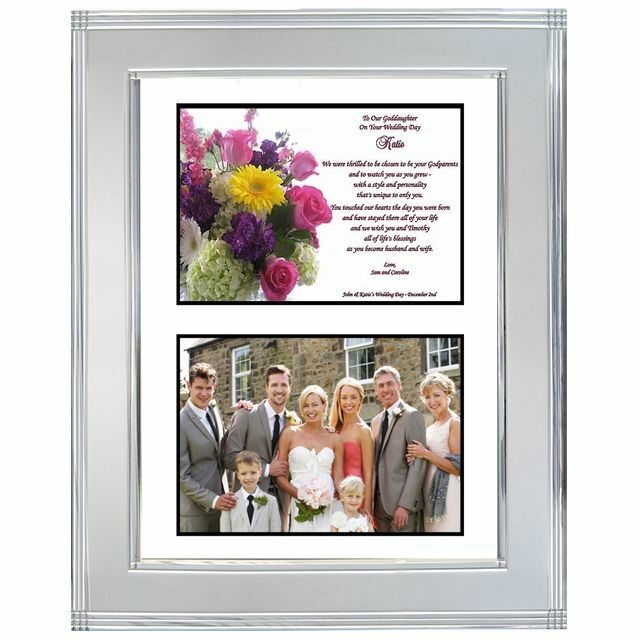 Personalized poem in a classic design presented on quality heavy stock paper framed in a sleek silver metallic frame with glass front that gives your gift an elegant look. The 8"x10" frame has an easel back for standing as well as clips for hanging. There is no need to send us a photo. You or the gift recipient can easily add a 4x6 inch photo after the Poetry Gift arrives. The photo should be positioned in back of the mat opening. You have the option of attaching a photo before you give the person the gift or the person receiving the gift can easily add a photo. The frame is presented beautifully, very happy with my purchase. I was looking for something special to give to my goddaughter and this was perfect! It is beautiful! This is a beautiful gift for my god daughter. It is very special and unique. Love it!! The picture frame is absolutely beautiful. I have been looking for that something special and I found it here. The crystal frame is so nice and so is the poem. Was proud to give this keepsake to our Goddaughter.